PFAS, or per- and polyfluoroalkyl substances, are a pervasive group of manufactured chemicals that have been found in Michigan’s drinking water at certain sites. 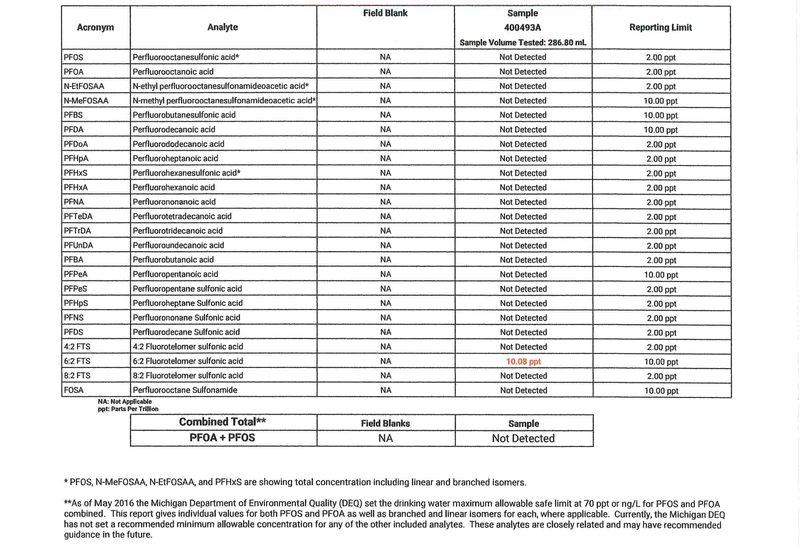 The Michigan Department of Environmental Quality (MDEQ) has recognized 36 confirmed PFAS sites but they estimate that there could be as many as 11,300 potential sites where PFAS may have been used. You may still be wondering what exactly PFAS is and how did it get here. PFAS is a family of more than 3,000 manufactured chemicals that were put into production in the 1950s. PFAS contains unique properties that allowed manufacturers to create waterproof, stain resistant and non-stick products. How does PFAS impact health? Research has suggested that PFAS can cause numerous health concerns. PFAS may increase thyroid disease, decrease fertility in women, cause developmental issues in infants and older children, as well as increase blood pressure and cholesterol levels. Studies have also shown that there is a link to PFAS exposure and increased risks of kidney and testicular cancer. Regardless if you have well water or public, if you have been informed that you are in an area where the water could potentially be contaminated or you know it has been, it’s important to test your water (especially in the Rockford area). There are EPA-approved labs that send kits directly to homeowners so that they can collect a sample and send it back for analysis; however, the test is very sensitive since it tests in parts per trillion and samples could be contaminated as they are collected and the samples need to be kept at a specific temperature. MDEQ officials strongly suggest that homeowners hire a professional/company to come and collect their water samples, as opposed to doing it on their own. Some of the firms that began actively testing homes in the Rockford and Belmont areas are Fleis & VandenBrink and Gordon Water Systems (although, there are other companies as well). This being said, test results typically take at least two weeks to be returned. Below you will see a sample of how a test results report would look. At GreenSquare Properties, we care about your health & believe it’s important to stay informed on potential health concerns, especially when it comes to testing your home for harmful chemicals.